Prior to starting his second consecutive game after missing five in a row with lower back pain, Bulls guard Derrick Rose declared himself pain-free and said he’s a go for the NBA All-Star Game on Sunday in Orlando. Rose scored 16 points go to with seven assists as Chicago routed Milwaukee to enter the All-Star break with an overall record of 27-8. On Monday afternoon, Rose recorded 23 points, six assists and five rebounds in 35 minutes of action as the Bulls defeated the Atlanta Hawks 90-79. “I felt good,” Rose said of the game. “If anything, I was trying to test myself to see if I still have it. I was just trying to play my game, that’s aggressive, and we started out pretty good. In the short-term, Rose will continue to see a chiropractor when his schedule allows with the hope that the pain stays away. While he experienced similar issues when he was in high school at Simeon Career Academy, he’s is optimistic that this is another isolated incident which will not be a long-term issue. As for this weekend’s NBA All-Star Game, Rose said he’ll be ready to go. Rose also addressed a report that surfaced earlier this week stating that he had talked to Bulls management suggesting the team explore a deal for Los Angeles Lakers forward Pau Gasol. On Wednesday, he set the record straight. Asked if he talked to Carlos Boozer, who was reported to be involved in a potential deal for Gasol, Rose said had spoken with his teammate about the rumors. 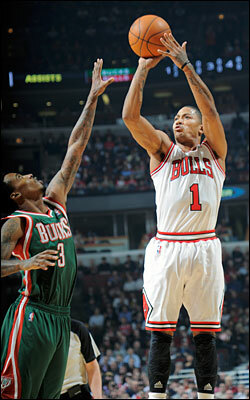 In the past, Rose has expressed nothing but content for his teammates, and on Wednesday, he reiterated that sentiment.